Lamar Plaza is gone. It’s just a hole in the ground now. Since late 2012, dozens of local businesses vacated a shopping plaza that served as the heart of South Lamar, to make way for an upscale apartment complex and a revamped Alamo Drafthouse with new retailers and restaurants. As recently as January 2011, the Austin American-Statesman called South Lamar a “once-gritty row of used-car lots and repair shops,” but noted that it had “evolved into a dense collection of locally owned businesses,” many opening in the last decade. Why all the local businesses on South Lamar? For the locals who live there, it’s their neighborhood. 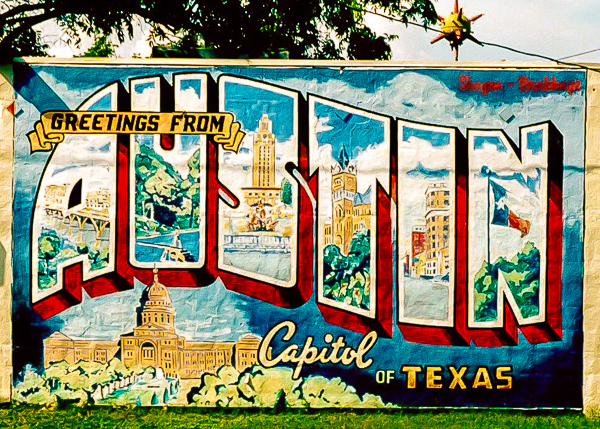 And because given a choice, most Austin locals choose to go local. Update: A timely Austin American-Statesman story by Gary Dinges appeared May 19 after this was posted, and could have just as easily been titled, “Another hole in the ground for progress.” Read the full story, “South Lamar area’s transformation continues,” here. My aunt lived right across the street from Lamar Plaza back in the early 60s and I remember her house and the neighborhood fondly. But times change. And not neccessarily for the better. Cities need revenue. Lots of revenue. And to feed their never ending appetite, what better way than to corral and persuade people to live in hyped-up dorm-like structures so cities collect much higher property taxes than individually-owned businesses could offer. What a great memory–I’m sure many Lamar-area residents can relate to your comment. And once again, there goes the neighborhood. And affordable housing and the lively fabric of authentic community with it.